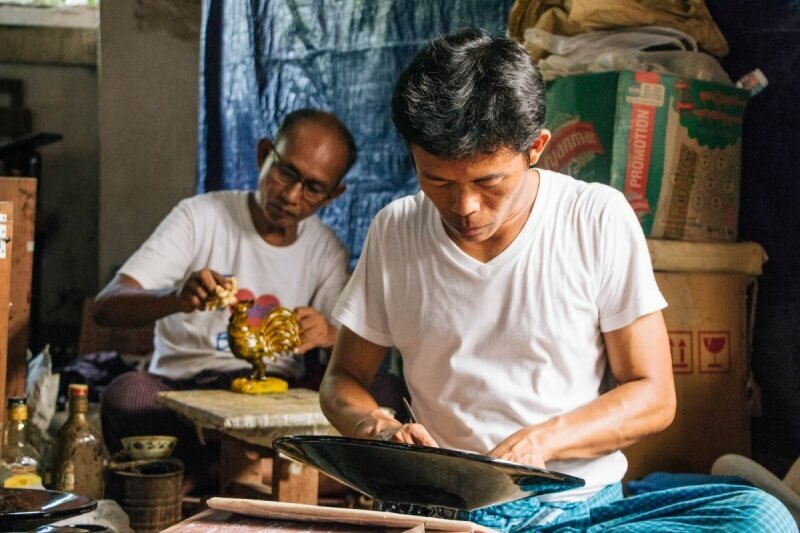 The Golden Bagan Lacquerware workshop in Bagan is one of several artisan workshops where you can see how lacquerware is made. It’s a neat way to get shots of artisans working their craft. Another popular lacquerware shop is the Bagan House Lacquerware workshop. I expect the experience is quite similar. Best time The workshop is open from around 9am to 9pm but obviously you want to go when the light is still bright out as most of the light comes from the windows. Best gear It's indoors, so a faster (large aperture) walkaround might come in handy. When we visited, our guide from FlashPack talked us through the process of how the lacquerware is made. Multiple layers of inky black lacquer are applied onto baskets, bowls, plates and furniture. 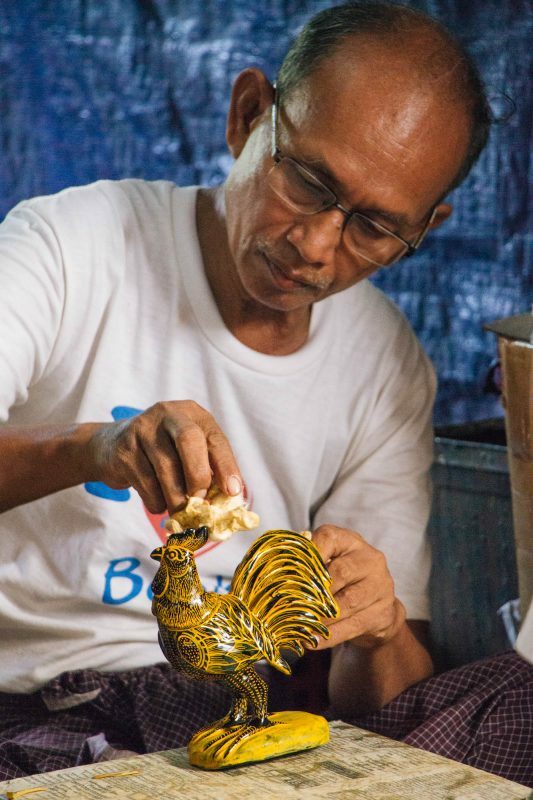 The artists scrape patterns into the lacquer by hand and then apply dyes that soak into the scratched designs. 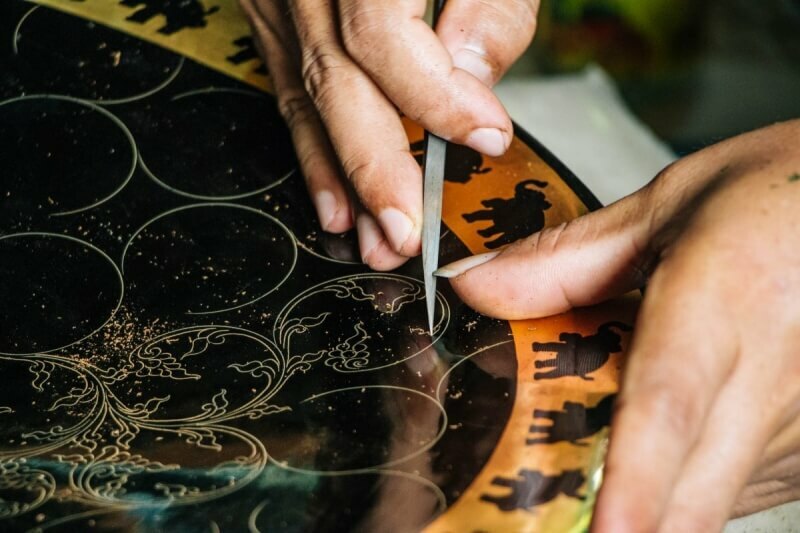 At Golden Bagan Lacquerware workshop, you will see artisans working on various steps of the process. It’s a small area so go ahead and do a once around and to get a feel for the process before picking your subjects and perspectives. The artists are intent on their work and not at all bothered by the guides or photography so feel free to shoot away. Use the beautiful natural light coming through the windows to get great photographs of the artists. I shot wide open to help focus on the work itself. If you use a lens with a really low aperture like 1.4, you can get even narrower depth of field. Warning – there’s a lot of random clutter in the background so having that blur out is a good idea. Otherwise you get a pretty busy image that’s not as compelling. I love zooming in to focus on the hands of the artisans. There’s something so expressive about people’s hands especially when they are creating something. In this shot, you can see her creating a basket of bamboo strips using a mold to shape it. If the light is low you might want to bump up the ISO to avoid blurring the moving hands. It’s also cool to see handmade things being created because so much of what we use these days is machine-made. In this one, you can how the artisan uses his fingernail to direct the tool, and also see how beautifully precise his patterns are. Finally, I also wanted to get a shot of what the final work looks like as well and let that shine for itself. I still got the artist in the shot but the eye is drawn to the intricate carvings on the furniture at first. 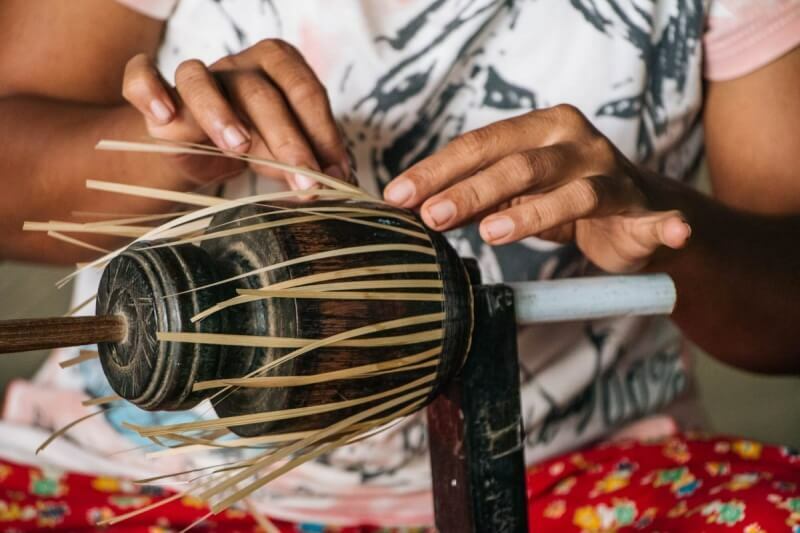 The Golden Bagan Lacquerware workshop gives you some great photographs of local culture to take back with you. Buy a piece from the store, and you’ll also have the photos to add color and remind you of the artisans that made it. 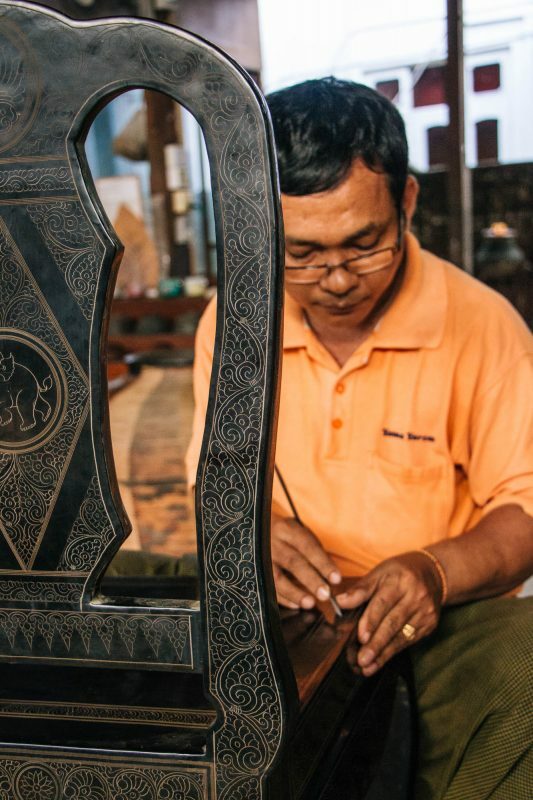 Have you visited one of the lacquerware workshops in Bagan? Share your photos in the comments!